Banm Mi – I’m bringing spicy back! Shortly before I moved away from San Diego I discovered this Vietnamese bakery that sold some of the best sandwiches. Crunchy baguettes filled with just the right amount of lettuce, barbecued pork, pickled vegetables, and cilantro; these little sandwiches were not only tasty they were very cheap – about THREE BUCKS! We had these sandwiches several times before we made the trek back east. Bánh mì is a Vietnamese baguette made with wheat and rice flour or a type of sandwich traditionally made with this type of baguette. The sandwich is made up of thinly sliced pickled carrots, daikon, onions, cilantro, and meat or tofu. 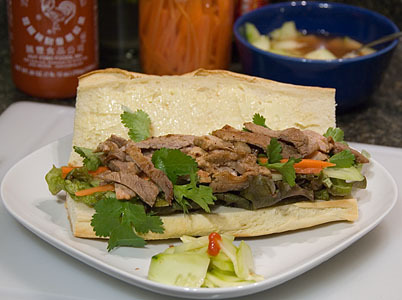 Popular bánh mì fillings include pork, paté, chicken, and head cheese. The contrasting flavors and textures of the sandwich — as well as its relatively low cost — make it a popular dish. 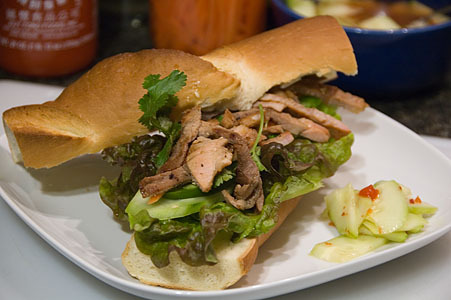 I made a cursory search of my immediate surroundings and haven’t been able to find a Vietnamese shop that offers these sandwiches in the way I remember them. So I did what any self-respecting ex-chef would do, I recreated them how I remembered. I searched around the web for a pickled vegetable recipe and finally settled on the recipe over at Battle of the Banh Mi. I wasn’t able to find daikon at the normal mega-mart and didn’t make a trip to the Asian stores so I just used carrots. I think the flavors would have turned out a little bit better with the mix of carrots and daikon but the thought of not having any pickles on my Banh MI was out of the question. I should warn you that their recipe makes quite a large amount of pickles, which isn’t always a bad thing, is it? The vegetables are a pretty standard sandwich mix. I decided on red leaf lettuce since it looked good. A plain old cucumber, bunch of cilantro, and jalapeño pepper rounded out the mix. I’m sure once the summer comes around the selections of vegetables in the north east will drastically improve. For now, I settled on the best looking ones I could find at whole foods. For my first run of sandwiches I decided on using a nicely marbled pork shoulder. The pork shoulder was thinly sliced, marinated in a soy and ginger sauce, then quickly pan-fried. I then thinly sliced the pork into fat, match stick sized pieces. I had the pork both warm and cold and both were winners. If I knew it was going to come out so well I would have made much more! The last obstacle to overcome was getting a baguette that was somewhere between crunchy like a French baguette but also soft enough that it made for a decent sandwich. Right away I decided against buying a baguette since I’m almost never happy with that is available at the supermarkets. Rarely do I find a baguette that is worth the $3 price point it commands. I scoured the internet and pieced together a recipe. It took a few tries, but this is the final recipe that I’ve been using. Place the yeast, 1 cup lukewarm water, and sugar in the bowl of a mixer with a dough hook. Mix together the all-purpose flour, rice flour and salt in a separate bowl. Starting the mixer at the lowest speed gradually add the dry ingredients and beat until well combined, about 3 minutes. Add the butter to the dough. Increase the speed to medium and continue beating the dough until it is smooth and comes away from the sides of the mixing bowl easily. Put the dough on a lightly floured surface, cover with plastic wrap, and allow to rise (double in volume), 45 minutes to 1 hour. Punch down the dough and separate into 4 portions. Shape each into an 8-inch-long baguette. (The dough may be sticky and hard to handle at this point. Do not overwork it, just gently shape it.) Cover loosely with plastic wrap and allow to rise a second time, about 45 minutes. Place baking stone on a rack set in the middle of the oven and preheat the oven to 415 degrees Fahrenheit. With a sharp knife blade or a clean razor blade, make three diagonal slits along the top of each baguette. Bake either directly on the stone or on a sheet pan for about 20 minutes or until golden brown. There’s nothing special about how the sandwich is put together. If you’ve ever made a sandwich before this should be pretty simple. A thin layer of Japanese mayo ties the sandwich together while the thinly sliced jalapeños and sriracha hot sauce added the much needed spicy that this sandwich deserved. These came out so well (and I made so many pickles) that I was able to experiment a little bit. What isn’t pictured is a version of this sandwich with a thinly rolled omelet. I’m trying to get the courage up to try a spam version of this sandwich. I’m sure it isn’t an original idea, but the thought has invaded my mind recently. Larb on the sandwich – oh please provide details! MMmhhhhhmmm! This looks great! We love the addition of the red leaf lettuce, nice color and textures here. 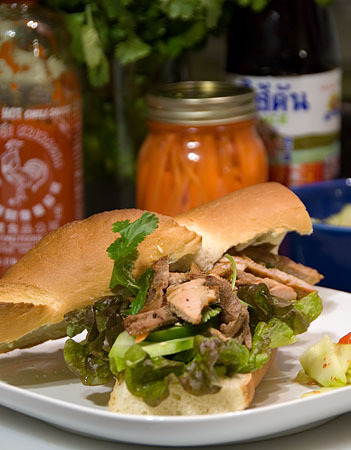 We’ve linked your recipe on the Battle Of The Banh Mi site for everyone to be inspired by. You brought up a good point about the volume of pickles our recipe makes, especially when you’re only wanting to make a few sandwiches. But they do keep well! We’ll be writing a recipe for a smaller amount of carrot/daikon. There will be lots of changes to the BBM in the next coming weeks. Let us know what you think! With all this WP fun I didn’t get a chance to get it posted. It should be up in a day or so. I think these Vietnamese baguettes actually came out better. Susan: It’s on the corner of Linda Vista and Mesa College drive. You should go check it out. Mmm… sounds good. Where was the place in San Diego? That’s where I live now. oh yum! some of that pork Larb I made today would go perfect with these baguettes!!!! Yummm. I used to go to a little place in Paris when I was student that had these. Brings back good memories.